I like this! Of course, as an old guy myself, I sometimes have problems remembering where I put the ammo. 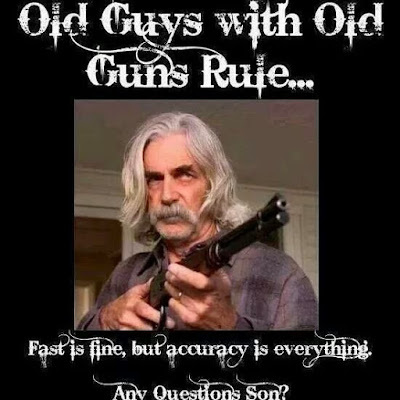 piss on the semi-autos, all ya need is a good revolver and a lever action, how about that for an old age (old school) response? Hell yeah! While those cartel-types are spraying the Universe with badly aimed guns that "fire promiscuously many times"("there is no honor in this; nothing is decided from this"--Jim Cornelius at "Frontier Partisans" will know the great old farts film where THIS quote comes from!) --all it takes per intruder is ONE carefully aimed, well placed ounce of lead to settle their hash......L.B. I am ashamed to have missed this. All hail "The Wind & the Lion"!